These words might have been hard to mutter for Ole Miss fans on Friday afternoon, as it’s impossible to watch your team get slashed 95-72 without a bad taste in your mouth. However, despite the Rebels’ dismal performance against Oklahoma in the first round of the 2019 NCAA Tournament, Ole Miss basketball fans should be able to look back at the season with a smile. Kermit Davis came to Oxford last March looking to change a culture of losing in The Pavilion. He inherited a squad that was picked to be the worst team in the SEC for the second time in a row and a distant third sport on the campus radar behind football and baseball. Fast forward a year and there’s a line of students wrapped around The Pavillion trying to get into the student section, the Rebels are going toe-to-toe with top-ten programs like Tennessee and Kentucky in games that are going down to the wire, and Ole Miss basketball is on the national radar. Anyone who tells you they saw this coming is lying to you. The hiring of the Leaksville native and Mississippi State alum has been a slam dunk for Ole Miss Athletics Director Ross Bjork and the administration, as Davis was able to come in and squeeze every ounce of potential out of this roster almost immediately. Devontae Shuler ran the offense with confidence and precision despite battling a foot injury throughout the season. Breein Tyree turned into a walking bucket liable to take over a game at any moment. Terence Davis frequently showed that he was the most athletic player on the court, dunking on anyone foolish enough to get in between him and the rim. Two freshmen, K.J. Buffen and Blake Hinson, showed they can be a force to be reckoned with in the SEC for years to come. Bruce Stevens and Dominik Olejniczak were able to piece together some good performances at the center position down the stretch. Former walk-on D.C. Davis even came on to give the Rebels productive minutes throughout the season. This overall boost in the team’s production is a result of a brilliant coaching job, but anyone who has followed Ole Miss basketball will tell you this team had a different swagger about them. The team enjoyed overwhelming support from around campus. The success on the court played a role in that, but when Devontae Shuler and his teammates decided to kneel in protest of a neo-Confederate rally on campus before the victory over Georgia on Feb. 23, it became evident that the Ole Miss faithful were behind this squad in a way that went past basketball. The team grinded their way to a 20-13 overall record, tying for sixth in the league. This is relatively successful, but Kermit Davis expects more. Now, Davis can pivot his focus to his first recruiting class at Ole Miss. He has the task of bringing in the first group of freshmen that can truly fit the system he’s going to run. 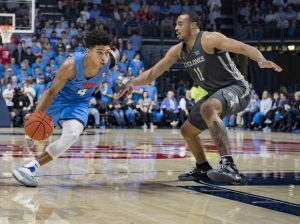 The success on the court, with an inherited roster and the new hectic energy captured in “Club Red” during the season, will be in his back pocket as he speaks with prospective Rebels. After the first year of the Kermit Davis era, the trajectory of the Ole Miss basketball program looks to be ahead of schedule, trending upward rather than going in a straight line. Kermit Davis and his staff will not settle for being consistently average.